1991. One hundred miles from the Kuwaiti border, Thomas Benton meets Arwood Hobbes. Benton is a British journalist who is starting an ambitious career reporting from war zones, resulting in the estrangement of his wife and daughter; Arwood is a naive small-town American private bored out of his skull waiting for something—anything—to happen. Desert Storm is over, peace has been declared, but as they argue about whether it makes sense to cross the nearest border in search of an ice cream, they become embroiled in a horrific attack in which a young local girl in a green dress is killed as they are trying to protect her. The two men walk away into their respective lives. But something has cracked for them both. Twenty-two years later, in another place, in another war, they meet again as changed men. Time, politics, or maybe fate is now offering an unlikely opportunity to redeem themselves when that same girl in green is found alive and in need of salvation. Or is she? DEREK B. MILLER has worked on international peace and security for think tanks, diplomatic missions, and the United Nations. His first novel, Norwegian by Night, was an Indies Choice Honor Book, an Economist best book of 2013, and a winner of the Crime Writers' Association's John Creasey Dagger Award. 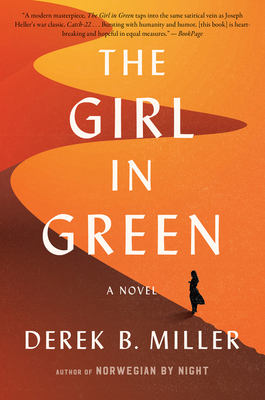 His second novel, The Girl in Green, was published in 2017. Born and raised in Boston, Miller has lived abroad for more than fifteen years, in Norway, Switzerland, Britain, Israel, and Hungary. He now lives in Oslo, Norway, with his wife and two children.